Payday loans and other services under fire. Ontario wants your input. With a view to strengthening consumer financial protection in Ontario, the provincial government is again taking aim at payday loans. It’s now seeking public input about these high-cost “alternative financial services.” Not only that, but other “alternative” money services – which like payday loans are not available through mainstream banking and borrowing institutions – are in the government’s sights. Payday loans have been under fire in Ontario for years. Payday loan companies often trap low-income earners – or cash-strapped individuals – in grievous cycles of short-term borrowing at high interest. Questions and complaints have been mounting around the services these companies offer, including cheque cashing, money transfers, debt collections, instalment loans and rent-to-own plans. The government is inviting Ontario consumers to express their opinions about payday loans. The provincial government is inviting Ontario consumers to express their opinions by way of public meetings, or online by way of a special survey. The Ministry of Government and Consumer Services is especially interested in hearing from those who have experienced the services in question. The ministry also is inviting input from businesses that offer the services, community agencies and qualified credit counsellors. Register to join discussion groups at gatherings in a number of Ontario municipalities. To register your feedback immediately go online to fill out the government survey. Feedback can be submitted until August 14, 2015. Grey County July 16 2:00 p.m. to 5:00 p.m.
Guelph July 20 2:00 p.m. to 5:00 p.m.
Thunder Bay July 22 2:00 p.m. to 5:00 p.m.
Ottawa July 23 2:00 p.m. to 5:00 p.m.
Windsor July 27-28 2:00 p.m. to 5:00 p.m. Please note that immediate registration for the Toronto meeting on July 7th is highly recommended since the date is fast approaching. The meeting will run from 10:00 a.m. to noon at the Central YMCA, 20 Grosvenor Street, Toronto, ON (in the Grosvenor Room). 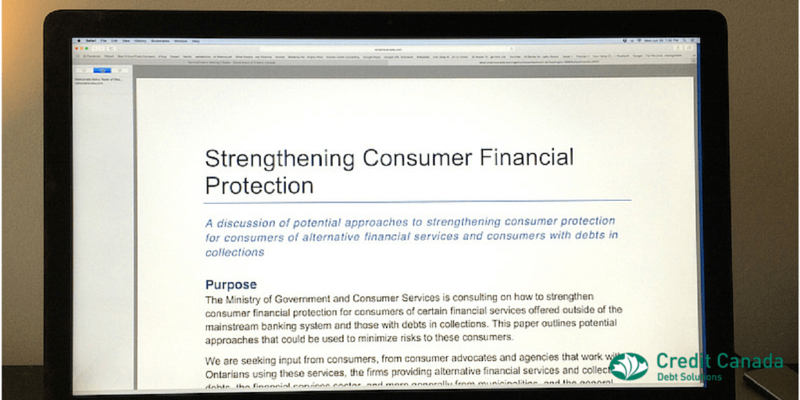 If you would like to organize your own discussion about strengthening consumer financial protection, please email consumerpolicy@ontario.ca with the subject “Self-guided Consultation” to receive a package of materials.